THE place to discuss Godzilla, giant monsters & Japanese sci-fi and horror in a cordial and friendly atmosphere! Is it even worth bothering to get into these if I don't have thousands of dollars lying around? canofhumdingers wrote: Kiryu-Goji is not anywhere close to my favorite suit designs so I've not got much interest in the figure myself, but it's certainly good news and hopefully the start of a new trend in the line. I resent the first movie's use of Godzilla a lot - just standing there, doing nothing for five minutes - in GxMG, but do like the design and it deserved to be made alongside Kiryu. 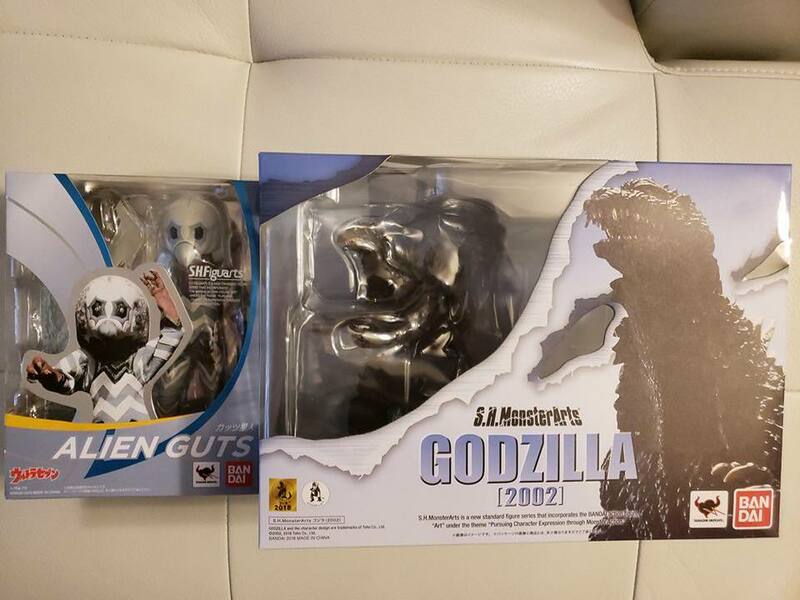 I'm really happy that I can complete the pair in MonsterArts form! Wonder if Bandai would go in on a Tokyo SOS/Final Wars Mothra to complete it as well. kidnicky wrote: Is it even worth bothering to get into these if I don't have thousands of dollars lying around? If you want to play catchup and are starting from scratch, you're in for a bad time. Plenty of large and expensive figures in the line that make the prospect unappealing. You'd need a time machine to get several figures at more reasonable prices. If you only want a single favorite design and it's not hundreds of dollars on the secondary market, there's no harm in going that route. 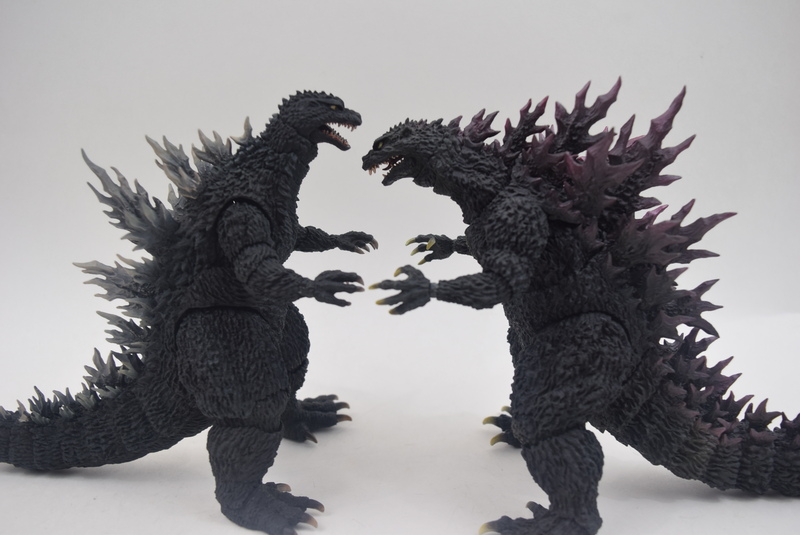 One or two MonsterArts duking it out against each other or doing silly things on your desk could totally be fun and worthwhile. Depends on what you want. 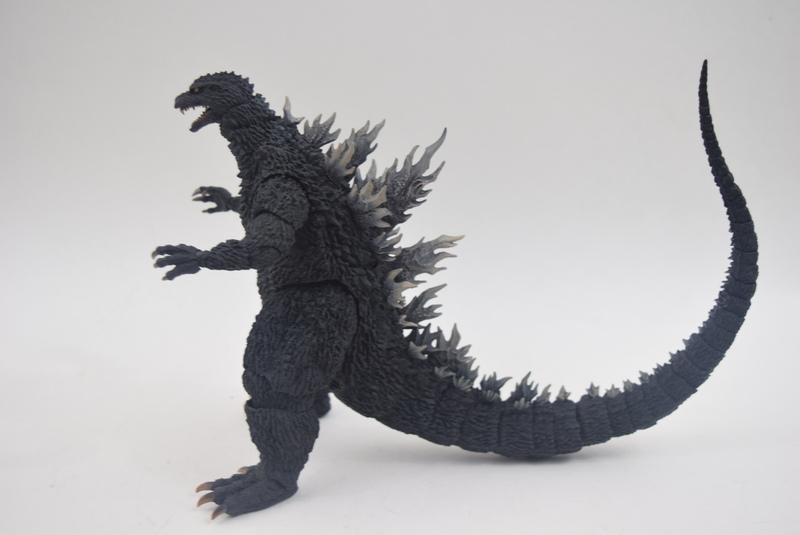 Well he is one of my top favorite Godzilla designs, if not the the top, so I am super excited we are finally getting him. Plus, it's nice to not have just another repaint. maybe I will,then. I'd probably only get a couple anyway,regardless of cost. 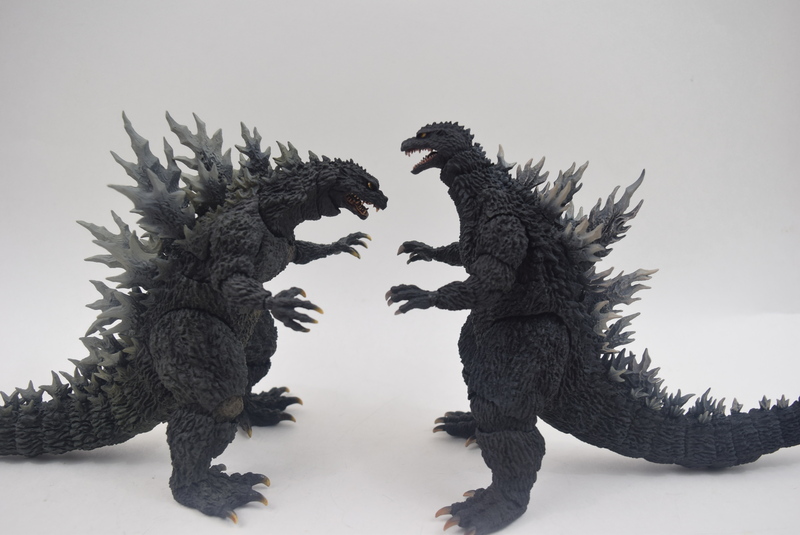 Kiryu -Goji went up for presale last night on HLJ. They have already put an order stop on the figure today, it basicly sold out in 24 hours. Next MonsterArts release is another exclusive, another Shin: frozen version from the end of the movie. Anybody get MG 74 yet? The appropriate amount of articulation for frozen Shin Godzilla is 0 points. Bandai is just milking that Shin mold and yet they still won't sell the thing in the US. The fact that they are repainting it as the statue version is just so damn stupid. I can't wait for them to release the knocked out version from the dentistry scene. Dr Kain wrote: Bandai is just milking that Shin mold and yet they still won't sell the thing in the US. Its not that they won't its because they can't release it stateside due to licensing agreements. I'll get MG74 when that goes on sale and probably nothing else unless they do something I really want. What do you mean? 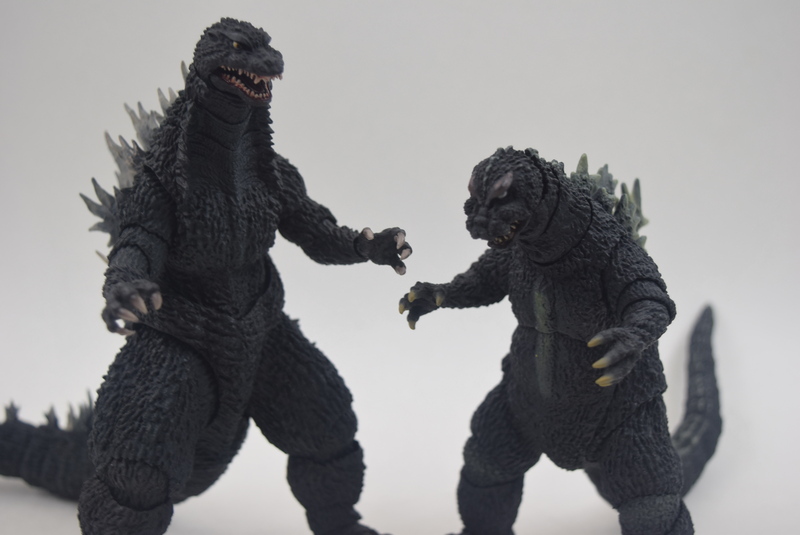 The 54 Godzilla MonsterArts has been collecting virtual dust on Amazon. I've had him (and GMK) in my cart for more than a year waiting for him to drop to $50 or below. As for MG74, I was all excited, but after watching Diego Doom's review, I can't justify $90 on it. I'll also wait for a price drop. $60 I will definitely do. 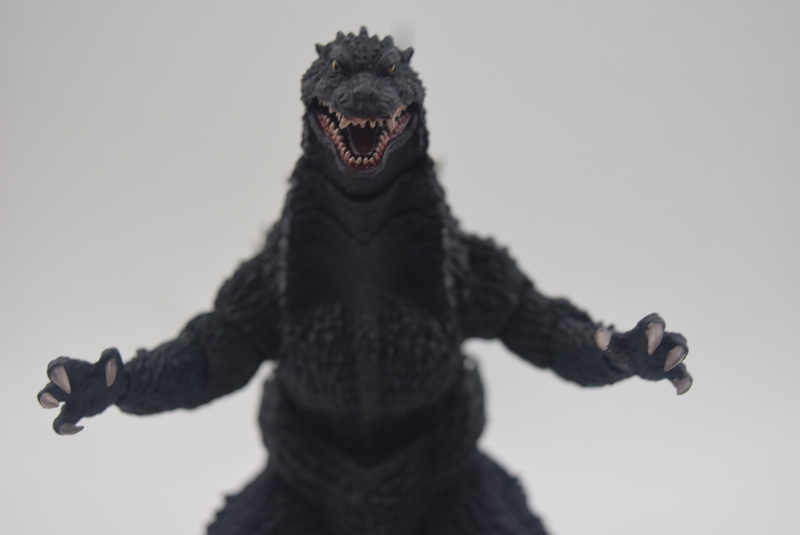 Sadly, because of Bluefin's incompetence (sorry, I don't see how they can suddenly have licensing issues for the movies from Final Wars and before) I had to preorder Kiryu Goji at AmiAmi. G54 is now OOP on Amazon and I had to go through a third party seller. Licensing stuff post G14 is up in the air now. Tom R VanSlambrouck wrote: G54 is now OOP on Amazon and I had to go through a third party seller. That happens all of the time though. Amazon will get more in soon. 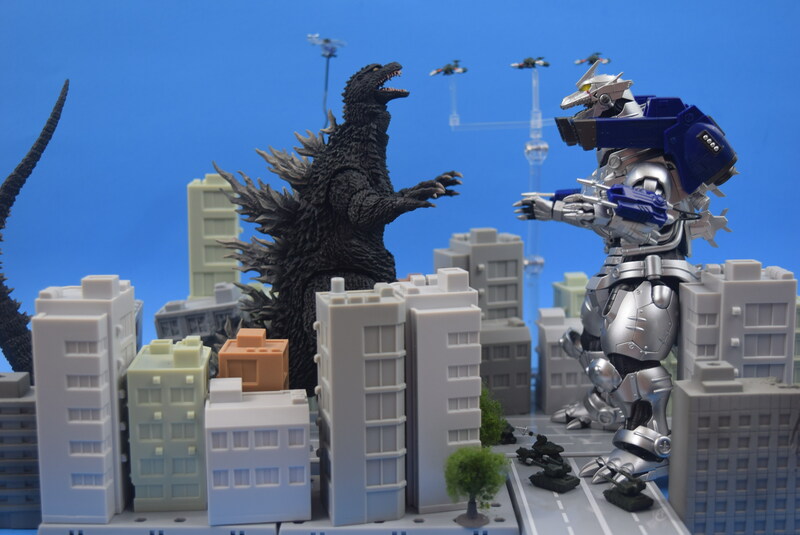 Godzilla Against MechaGodzilla is pre-Godzilla 2014. Wait, is Biollante really selling for a grand? If so, I might sell mine off and just save some of that money when the repaint comes out. G2002 isn't coming stateside though it's Japanese exclusive. MG74 is the only figure in recent memory that has made it stateside. You can search sold listings to see what people are actually paying. Over the last few months Biollante has gone for a low of $350 and a high of around $600, but generally around $400-$500. Ghidorah has generally sold for $150-$300. So in short, no, they are not selling for the insanely high prices. But they do usually go at or above MSRP. I'm surprised nobody mentioned the few SHMA news pieces that have dropped over the past couple of weeks. Bluefin was able to work out a deal to release G02 here stateside and to coincide with it's release Tamashii announced another Kiryu figure based on the first Kiryu. This one comes with a battle damaged arm, and eye piece as well as a beam effect for the AZC. Tom R VanSlambrouck wrote: I'm surprised nobody mentioned the few SHMA news pieces that have dropped over the past couple of weeks. Bluefin was able to work out a deal to release G02 here stateside and to coincide with it's release Tamashii announced another Kiryu figure based on the first Kiryu. This one comes with a battle damaged arm, and eye piece as well as a beam effect for the AZC. 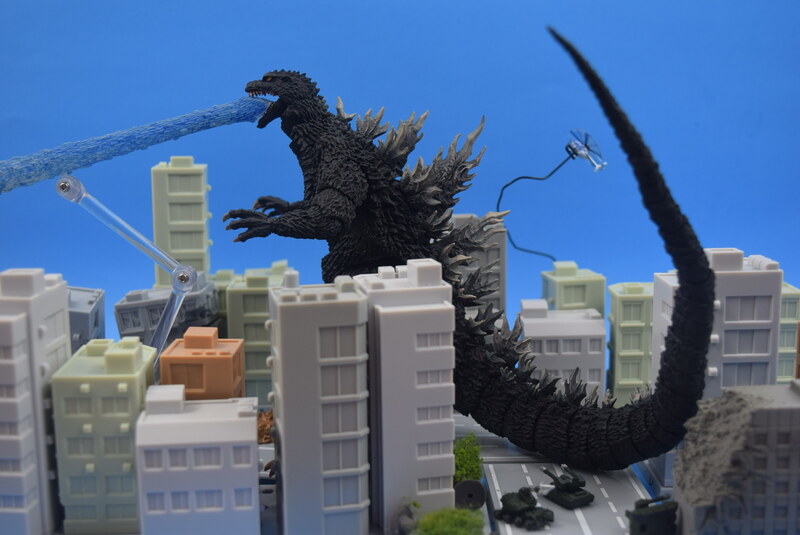 Well it's pretty much a repaint of Kiryu, but it is cool that they are doing this due to the Godzilla that goes with him coming out. MonsterArts as a whole has just become a meh line. At this point, I don't even care anymore. If something comes out I want, cool, I'll pick it up when I can. If it doesn't happen, then eh, whatever. 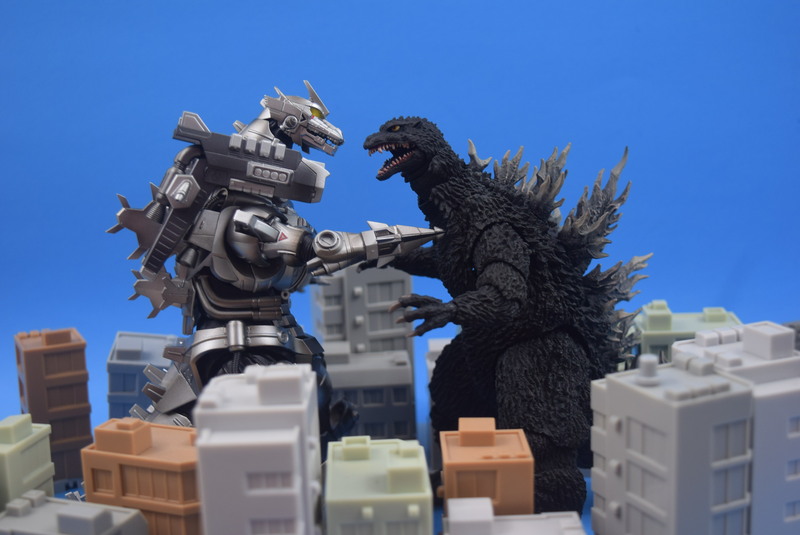 Dr Kain wrote: Well it's pretty much a repaint of Kiryu, but it is cool that they are doing this due to the Godzilla that goes with him coming out. 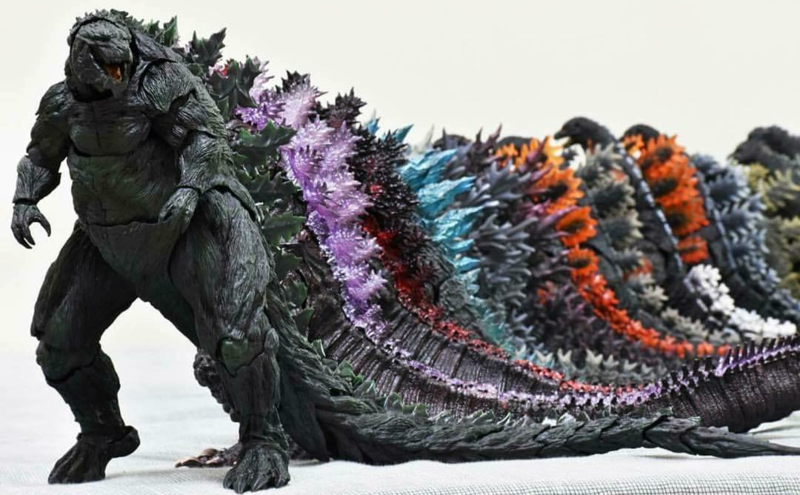 MonsterArts as a whole has just become a meh line. At this point, I don't even care anymore. If something comes out I want, cool, I'll pick it up when I can. If it doesn't happen, then eh, whatever. Yeah, for the longest time I latched on to any and all news about the line, now if it's not a new figure I basically don't care. This new Kiryu is neat but I have the first release but it makes me think if they'll be making a battle damage Tokyo SOS Kiryu soon (which might entice me since I didn't pick that one up and like the darker tone of the metal) too. And even though G2002 is a new figure, he's not my favorite design and I'm sure they'll come out with a SOS version with a scared chest, which I'd be more willing to get. 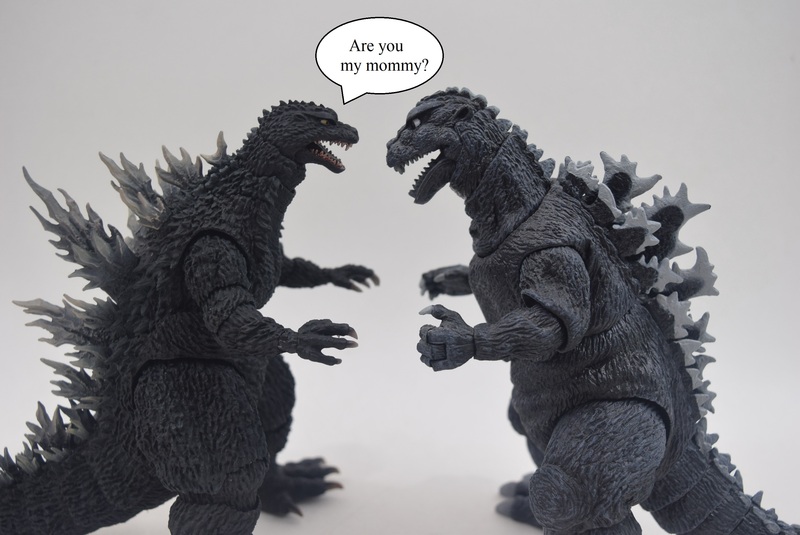 So earlier this week I decided to open my Spitfire Godzilla 14 and it's probably my least favorite figure because it feels like its made of a cheaper material than the other figures and as per my luck I got hit with major QC issues. Most notably a huge gap between the main body and where the tail connects. Plus on top of that mine looks like it has a permanent lean to the right. I'm just thankfully my Shin Awakening figure has minor QC issues mainly just paint spots on the feet where toes should be. It seems like almost every SHMA I get has major QC issues with it. Hell I had to return my MKG three times to Amazon before finally giving up on the figure. On top of that I still haven't gotten my G54 figure yet and that shipped over two months ago. I'm 90% certain the seller either never shipped it or it got lost in the mail and with out tracking info there's no way to be certain. I guess if it doesn't show up by the middle of May I'll try reordering it again. I'll have some extra money from house sitting for my aunt. 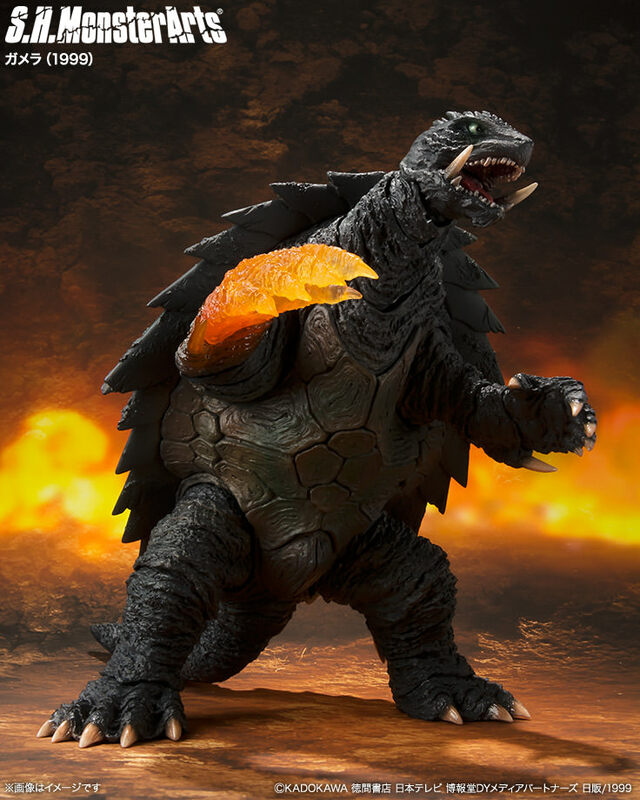 Next figure is a mass-release and out of left field: Gamera 1999! October release, 10800 yen MSRP.